Home - Go Navy Go! Welcome to Go Navy Go! When you reflect on your life to date, what event leaps to mind as most inspiring? 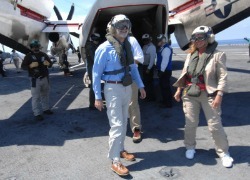 For me, my September 2009 participation in the U.S. Navy’s Leaders to Sea program counts as one of them. Join me virtually, aboard the aircraft carrier USS Harry S. Truman (CVN 75), where I was privileged to observe ship operations for more than 24 hours. My personal favorite page is the Flight Deck Tour, so if you only have time for a brief visit, feel free to begin there. During the coming months, I want to network with people who are interested in learning more about the Navy. It’s one way I hope to pay back the Navy for the amazing experience they shared with me. Please help me spread the word by sharing this site with others. Or contact me if you or your group would be interested in learning more.